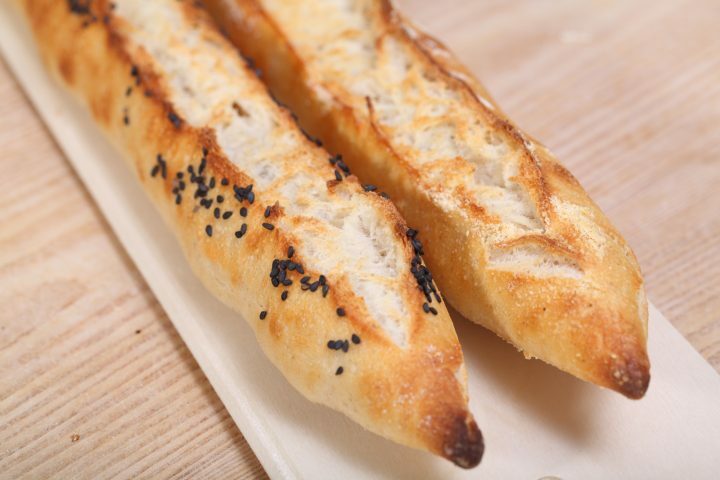 A ficelle is an elegant and slender version of a baguette. Ficelle means string in French. This slimmer version of the French baguette came about after some experimenting with different types of preferment and flour. The result is a very tasty, crunchy, somewhat chewy and you could even say cute bread with a very interesting taste and texture. It is a great place to start if you have not made baguettes before. It will give you good practice, with shaping and scoring, which we kept slightly easier for this recipe. In this recipe we use a combination of bread flour and semolina / durum flour which adds to the chew and crust and different flavor profile. You can make these using only bread flour of course, but if you can get semolina, just give it a try. This hybrid version, with yeast in the final dough, and a sourdough preferment with a same day fermenting period, gives a complexity of taste without adding too much sourness, leaving room for the sweetness we like in these types of bread. It is a great recipe for you to experiment with and make your own. Because of the limitations of our stone oven, we can only make these ficelles 48 cm long. If you have more room, you can of course make them even longer and thinner. For this recipe we are going to make a preferment named a poolish. A poolish is a type of preferment made with an equal weight of water and flour and a small amount of sourdough starter culture or yeast and NO salt. Making a poolish helps bring more taste and strength to your bread. 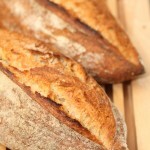 * We use a sourdough culture made with 100% organic whole rye flour. A sourdough culture based on rye flour is easier to maintain, does not go into a slurry when you forget about it, is easier to stir because it has almost no gluten and smells very nice, a bit like fruit. It is also very forgiving in the amount you feed it. Normally we only feed it once a week, after our weekend baking we give it a few table spoons of water and rye flour, stir, ready! Tip: If you want to make a version without the sourdough, make a poolish with yeast. For this recipe you can add 0.7 grams / a quarter teaspoon of instant yeast to the poolish. In a bowl stir together the flour and water at room temperature with the sourdough culture. Do not use cold water as this will slow down the sourdough development. Mix it well until you have a homogeneous slurry that looks like very thick batter. Cover the bowl with clingfilm and let the prefermenting begin. After 6 hours at room temperature it should be bubbly, light and ready for use. For a one day recipe we make the poolish in the morning and begin our bread making in the afternoon. In the bowl of your standing mixer, combine the poolish with the other ingredients and knead for 7 minutes on a low speed. If you knead by hand it takes about 15 minutes, depending on your technique. Cover and leave to rest for 30 minutes. Now turn out the dough onto your work surface and stretch and fold, doing one full set letter fold (one set = right over left, left over right, bottom over top, top over bottom). You can also do this stretching and folding in your bowl. If you are not familiar with it, check out how this technique works in this video first. After this stretching and folding to help develop the dough, again leave the dough to rest for 30 minutes. For these slim baguettes we use a simple but effective shaping technique. 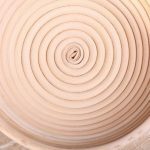 Turn the dough out onto your work surface and divide it into four equal parts. Shape each part into a rectangle (around 20 x 14 cm / 7.8 x 5.5 inches), cover with floured clingfilm and leave to rest for 10 minutes, so the gluten can relax. Now shape each rectangle as shown in the pictures above. Fold both sides to the middle, fold again and carefully close the seem of the dough with the heel of your hand. Make a rolling motion with your hands starting from the center and moving to the sides, with a soft and even touch. This way you elongate the ficelle. Finish the ficelle with some nice pointy ends on both sides. Cover with clingfilm and leave to rest for 20 minutes in a couche or on your bench, making sure you use enough flour or semolina so they will not stick to the surface. If you are not baking them on a stone you can also do this final proofing on the baking sheet you will use in your oven of course. Transfer the ficelles to a breadboard or peel. Score the ficelles with a lame / scoring knife. In the pictures you can see that we did one big scoring motion along the length of the ficelle, which works very well for this small surface and gives a nice end result. As a variation you can sprinkle some ficelles with (black) sesame or nigella seeds. Slide the ficelles in the (to 240ºC / 465ºF) preheated oven and bake for 20 minutes. Leave to cool on a wire rack. To get a nice crust, try to create some steam in your oven by putting a small metal baking tray on your oven floor when you preheat the oven and pouring in half a cup of hot water immediately after putting the bread in the oven. If you are going to create steam with a baking tray, you maybe also want to turn your oven temperature a bit higher, because you are going to lose some heat in the process. Best eaten while fresh of course. You can also store the ficelles in the freezer and give them a quick pick me up in the oven or a big toaster. This table gives you an indication of the total duration for this recipe. 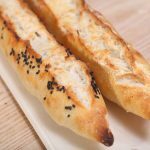 If you like to move on to the bigger baguettes check out our French baguette and 80% hydration baguette recipes! Thank you for this recipe. Made these and they are the best I’ve ever made! Thanks Kimberly, for your wonderful feedback. The ficelles do so well in the freezer too, even after many, many weeks with just a minute in the toaster after defrosting, they still taste very good. I am very excited about this recipe! Do you think a slightly longer overnight preferment would be ok? I would like to bake Saturday morning for lunch. Yes that is possible of course. Make it late in the evening and place in a cool room temperature spot. Hope it will be great! Omg! Thank you for this recipe. It was perfect! I made 3 instead of 4. Used all bread flour because that’s all I had. I will try the semolina and make 4 next time. Thanks again for sharing this! Thanks for trying the recipe and wonderful it turned out so well. 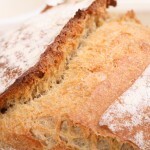 Hope you like the semolina version too, but using all bread flour is no problem of course as you have already noticed. Hey! What a great blog. I’m going to try to make the ficelles his weekend. Just a quick question about the sourdough starter, as I have one in my fridge. Does it need to first be fed and let rest before using, or can I just bring the starter to room temp and use as is? You probably already made a decision. It never hurts to refresh it, but if it was refreshed recently (less than a week ago) we use it without refreshing too and also straight from the fridge (because it is a relatively small quantity). With the added water you can make sure the total dough has the right temperature of around 24 to 25 Celsius. Hope it worked out well! Thank you! I did make the ficelles and they did turn out beautifully. I refreshed the starter as it was a while since I used it. Perfect little loaves. So happy I found this site. Great to read about your result Annie and thank you for your kind comment. Wishing you many happy baking hours from Holland! Thank you, this recipe worked beautifully. I am so pleased to find a site that uses a rye starter, it is the only one I keep. Thank you Gerry for your kind feedback and trying our recipe. Same here, we almost only use the rye sourdough, and have been doing so for many years. This is a great recipe, and the end results delicious. The semolina gives it a nice taste and the method is easy to follow and seems to be very reliable – done it twice now and beautiful results both times. Love reading your feedback Nick. Glad it worked so well for you too. Happy baking and eating and sharing this festive season! I made these last weekend, my first attempt at anything baguette-like. Despite a couple of minor mishaps (including a sourdough starter that was not as active as I’d thought), they came out great! I only made half the recipe, and had two lovely ficelles that were quickly devoured. Will definitely make them again – and maybe a whole recipe, since these disappeared so fast…. Thanks for another fantastic recipe, with clear instructions. Ps. Because I’m a whole grains girl, I subbed whole wheat flour for half of the white flour in the dough, and upped the water by a few grams. Since that went well, I might push my luck and also use half whole wheat in the poolish the next time…. Thank you so much Rebecca for your enthusiastic comment. Great to read the substitution with the whole wheat turned out so well. Using even more whole wheat will change the ficelle some more of course, but with your whole grains experience and very good small adjustments we are sure it will go well. Enjoy the baking and sharing this Holiday season. I am going to try these on the weekend. I prefer the idea of using just sourdough and no active yeast, will this work? Can you recommend how much extra starter to use to compensate? Yes you can make a 100% sourdough version. You do not need to adjust the amount of culture, but you do need to lengthen the resting and proofing times. We cannot tell you the exact times for this because every culture behaves different but a good place to start would be 50 minutes for the resting periods and at least 1 hour for the final proofing. Keep in mind that the consistency of crumb and crust (thicker) will be different. Personally we would keep the ficelles a bit thicker and shorter because of the crust crumb ratio (otherwise rather thick crust and less crumb when long and small). I made this recipe last night, and it was fabulous! I’m so happy to have a new recipe to use with my sourdough starter (which is fed religiously but all-too-seldom used). My old stone has become too disgusting to use, so I baked these on a parchment-lined baking sheet 12″ x 18″. Four ficelles was crowding it a bit–the sides of the ficelles were slightly pale. Also, my shaping was not perfect (the pointy ends were not very pointy at all after final proof). However, the crust and crumb were so very delicious. All four disappeared within a day. I may adjust quantities downwards to make three, which should give enough room for all sides to brown well. This will definitely go into my “preferred recipe” collection! Such a lovely comment to read this Saturday morning! Just makes you even more enthusiastic and eager to get baking yourself. With your adjustments the next bake will be even better we are sure. Excellent! Thanks Breadbites and enjoy the baking! 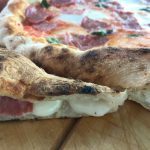 I would love to give this recipe a try but can you advise on replacing the 5g of instant yeast in the final dough? I wish to make pure sourdough ficelles. This is the challenge with each recipe, you cannot change one thing and leave the rest the same and expect a good result. If you want to make a sourdough version without adding any yeast, you need to change the proofing times, they will be much longer, but we cannot say exactly how much longer based on experience with this one. You need to at least double the times given, probably longer. You do not add any extra sourdough culture to the final dough, you just leave out the yeast. So, if you want, give it a try, it may need a few turns to get it right. Also, looking at the crust / crumb ratio of this very long and thin bread, with only sourdough the crust will get even thicker, the crumb will be different and the taste too of course. That is why we choose this hybrid version for this recipe, we like the taste and texture best this way. You could also play with the shape of the bread of course. Wow! This recipe is amazing! Thank you so much. I tried it today and it came out beautifully. I am newish to sourdough and this is my first go at baguettes. One question, can they be put in the fridge overnight after final shaping? Thank you very much for your wonderful feedback. Yes, it is possible to put the shaped ficelles in the fridge. Make sure you do cover them well, so they will not dry out. Also depending on the temperature of your fridge you will have to judge how long they can stay in for the best result and if they need a bit more proofing before or after this ‘retarding process’. Happy baking in the New Year! i am excited to find this recipe and going to try it after i find the semola/durum wheat flour. I don’t like sourdough so very happy to see the tip. Just wondering if anyone has added shredded cheese and mixed it in? i know, you’re probably doing the eek what are you thinking! But just asking the question. I see there is also the french baguette listed so will check that recipe too. I love making fresh bread and don’t make it as often as i like. But have not tried making baquettes yet and now that winter is here i will spend more time at home so great time to try. Thanks so much. No problem adding things to the recipe, but we always advice making a recipe as is at least a few times to get a feel for the dough and process! To me adding cheese will be good but, will it go with flour, it might chance the reactions by its melring. I do not know but to it aroused like that. Adding cheese will be no problem. Start with a small amount is our advice, and see how out works out (also with the salt content, because cheese has salt in to too). Be careful if you bake on a tray or stone to cover it with baking paper,so the cheese will not burn on the tray or stone. Hi, very excited to be baking these today- my poolish is sitting now. Could you leave the poolish over night to bake your ficelles first thing in the morning or is that too long for it? Maybe a bit (too) late but, yes you can do that, but you often have to make adjustments because of the longer fermenting period (it also depends on the activity of your sourdough). If you sourdough is very active you can use a bit less in the poolish or you can use a very cool space or the fridge to slow the process down. These are the most fun to make and absolutely the most delicious treat to eat! We have them with fresh mozzarella rolled with sun dried tomatoes and fresh basil or with good old butter! Love them. Make and sell them at a small farmers market with my other breads and they are by far the best seller. Thank you for this delightful recipe! Thank you so very much for sharing this wonderful success story with us. So great to hear, we can almost see you standing there with all your lovely breads. The combination with mozzarella or butter, cannot go wrong with that and also a firm favorite over here, you will not be surprised. Wishing you lots of loaves and ficelles and the best of times baking and selling at the farmers market! 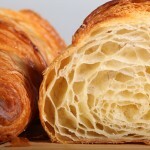 I will be baking these today, I was wondering how long your ficelle turn out as a final finish? I will be baking them in a cast iron roasting dish covered with a cast iron griddle. I have been baking rye sourdough bread in a dutch oven and it turns out great. Hope they will be as crispy as yours look. If not I will do your open baking method but I only have a gas oven not a perfect for bread stone oven. We do not really understand exactly what you mean with your first question (turn out as a final finish)? Hope it works (worked) out great! I tried this today using the instant yeast option – It came out looking and tasting great. Thank you for trying and liking it too! Hope it turned out great Fadel! Awesome recipe. Thanks for sharing! Thank you for liking it Lynda, hope you will give it a try! Thank you Dvorah for your enthusiastic feedback. Good to hear your method with the pan also works well.